"Ukraine’s rapprochement with the EU is held, inter alia, through the introduction of an efficient anti-corruption VAT refund system." 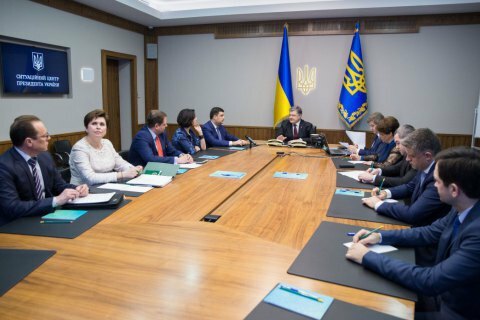 President Petro Poroshenko on 3 April held a meeting dedicated to the launch of an electronic register of automatic refund of value-added tax (VAT) in Ukraine. The president's website said Poroshenko stressed that the launch of the system of automatic VAT refund, because for a long time instead of transparent work, only speculation took place in this area. “Ukraine has been going to this day since 1996. Ukrainian entrepreneurs have been waiting for transparency in the VAT refund for 21 years. Unfortunately, the VAT refund system has been nourishing corrupt officials for 21 years. And this had a huge negative impact for the economy,” he stated. The president called the introduction of electronic administration of VAT refunds one of the important stages, which has a huge anti-corruption component. “Remember this day - on April 3, we launch the system of transparent public control over the VAT refund,” Poroshenko said. Among the advantages of the system, according to Petro Poroshenko, is the abolition of the manual mode of VAT refund and full automation of the process: everyone can control the date of the application, the tax will be refunded only in chronological order, the system of verifications will transparent, with proper justifications and fixed term. “The verdict delivery will be strictly controlled under the fixed term and nobody will be able to postpone without explanations, abolish or exclude from the register this or that taxpayer,” Poroshenko noted. He also stressed that the new system is based on the European model of VAT administration, in contrast to the previous practice of administering this tax in opaque conditions. Executive Director of the European Business Association Anna Derevyanko and President of the American Chamber of Commerce in Ukraine Andriy Gunder welcomed the creation and implementation of the automatic VAT refund register and called it "a step towards transparency in the work of the State Fiscal Service." On 1 April, the Ministry of Finance launched an electronic VAT refund register. The State Fiscal Service forms the register on the basis of business applications and fixes it with an electronic digital signature. The reimbursement occurs in chronological order (first came – first served, all other things being equal) and on a daily basis. Earlier in the day, Prime Minister Volodymyr Groysman, said the next step will be the introduction of electronic customs.